Halloween is coming friends! With that comes the joy of costumes, spooky decorations and more candy than anyone really needs. Candy can be a tricky thing (see what I did there?). On one hand, Halloween is only one day out of the year so why all the fuss? Some might argue that it’s silly to put a limit on candy and celebrating in schools because “let kids be kids”. On the other hand, we are all familiar with how early grocery stores start rolling out the candy, and how long it can linger around the house. So is it really just one day? As with most controversial issues, I find myself somewhere in middle. I encourage my clients to take candy off of the pedestal where it often resides. I also understand the power of creating a supportive environment, and I realize that as humans we often make decisions out of convenience. Today I wanted to share a few manageable strategies for avoiding a candy binge using one of my favorite models - the ABC assessment tool! When I was still working in an office, I clearly remember the break room conversation that started around this time of year and continued all the way through the new year. It was basically equal parts contemplation, restriction and guilt. Feel totally bad about themselves for doing so. The Antecedent, Behavior, Consequence (or ABC) assessment tool is just one way to observe problematic behaviors and then get to the root cause. Knowing this, if the goal is to change the outcome (or consequence), the first step is to modify the antecedent! Use this simple model to think about a current behavior that you want to change. Then think about what circumstances could be shifted around to make the behavior easier. 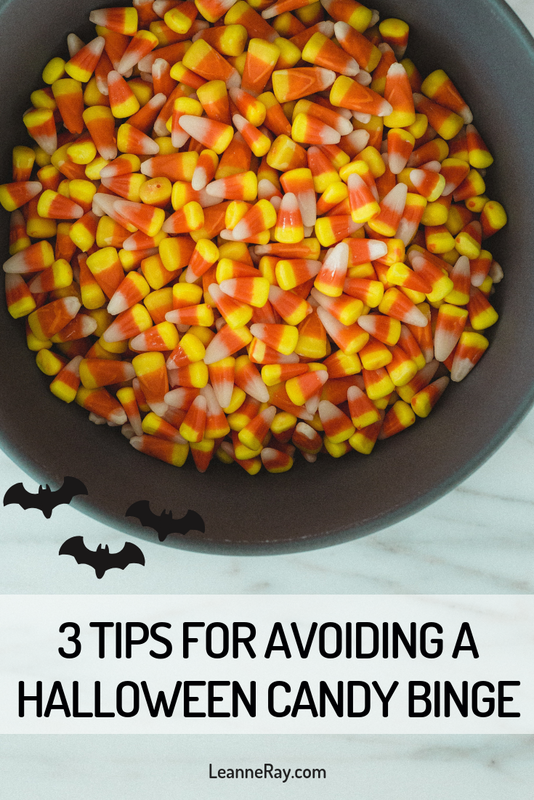 Here are three different ways you can change an antecedent using the candy example so you head into Halloween feeling prepared and empowered! The giant bags of candy are perfectly arranged and waiting for you at the store and if you have a sweet tooth, it can be tempting to buy more than you need to make sure you get some too. However by doing this, you might be setting yourself up to make a difficult decision every.single.time you walk by the candy bowl. Bake something that you can bring to a game night/football watch party/any other social event and distribute the wealth! If you know you’ll start seeing more candy in the days leading up to Halloween, be extra diligent about eating regular, balanced meals and snacks to keep yourself nourished and energized, sans the sugar. The benefits are two-fold: this prevents you from getting overly hungry and can also help prevent the inevitable sugar crash that comes from eating sweets on an empty stomach. Lastly, if you really love and look forward to a certain type of candy, come up with a game plan for how you can enjoy it in moderation. If you vow to completely restrict, there’s a good chance you’ll think about it even more and let me tell you, you have better things to think about! Hold yourself accountable by writing down your game plan and hanging it somewhere visible as a reminder. If you need some assistance, I’d be happy to help! If you struggle with situations like this on a regular basis, you might be a great candidate for 1:1 nutrition coaching and support! Schedule your free 15-minute intro call to learn more.